I have been trying to figure out the perfect time to go on my next bird outing. My past experience and education in the fields of Meteorology and Oceanography always has me thinking about the implications of the Quasi-geostrophic Omega Equation used in forecasting the effect of a deepening trough or low pressure system moving over Northern and Central Florida. I.E. is it going to rain? There was a very brief time in my life when I felt I actually understood how to derive, interpret, and apply the Quasi-geostrophic Omega Equation in atmospheric modeling. Those days are long gone (however, it does remind me of a “Sea Story” about “W and Omega” in one of Professor C P Chang’s classes). Now I just go to Broward Bob, the Little Blue Heron and local Broward River weather prognosticator extraordinaire. If he sees his reflection, it is going to be a great day. If not, have your rain gear ready. Bob wings by on a current of cool autumn air and flies over the lagoon to his favorite weather prediction location. It also just happens to be his favorite fishing hole. Bob tentatively steps out on a rock. He then applies the latest scientific method to test the water for toe temperature to ensure conditions are favorable for forecasting. Brrr...a bit chilly today here..may need to try another spot. Ahh...this place seems right. Bob moves his head from side to side, peering into the muddy Broward. Yep! There is his reflection. It is going to be a great day today! Now it's time for some breakfast. Bob starts with a quick crab bite and then some shrimp before feasting on some local minnows. Bob runs the new equations through his head..
After careful recalculation Bob peers down and sees his reflection.. Six more weeks of great autumn weather coming to Florida! Time to eat now! Bob has been doing this for a while...childhood photo of Broward Bob..before he turned blue..
All those computations make me hungry..and if Bob ain't happy..you know what they say! Good ole Bob..spelled the same forward and backwards.....The same yesterday, today and forever! Be blessed. Deja vu? Still got them Blues! The best way for me to beat the blues is to head to the dock where the “Blues Brothers” hangout. You know, Old Man River, the Great Blue Heron, Little Boy Blue, the Little Blue Heron, and my favorite “lil-blue buddy”, the Tricolored Heron. Old Man River blessed me with an annual fly by. He is still hanging out at the old familiar places. Little Boy Blue, the Little Blue Heron is busy chasing the juveniles away from his favorite fishing spots. Those youngsters are still all white and pesky. In a year or two they will turn all blue too! And my lil buddy, well I can’t say enough of how this bird makes me smile again. He let me go fishin for minnows with him one morning last week. We had a ball. Before you know it my spirits were back up and I was soaring just like the Eagle that flew overhead. So Mr. Bluebird, don't even think about poopin on my shoulder! It's Deja Vu all over again....I got the Blues....You too Little Blue? Old Man River The Great Blue Heron is still visiting his favorite hangouts...he glances at me as he wings by as if to say it's ok friend.. Even us Great Blue Herons get the blues sometimes...it will pass. If anyone should be singing the Blues, It's me said the Little Blue Heron...I got three new young ones to feed! But we are doing fine. Hey ole Buddy, Let's go fishing! It is my new Lil Buddy, the Tricolored Heron landing. I know just where to find them minnows..
Got some new wing fishing techniques I need to try out..saw this on a "Wingbook" post. Remember Mr Doohickey...I am not the only one who has eyes on you! Life is good here on the dock...see what I mean? Why worry! I'm good. Soaring like an Eagle..good bye blues! So Mr. Bluebird...don't even think about poopin on my shoulder! Be Blessed. The Good, The Bad...The Ugly! How many of you are still being affected by the change from Daylight Savings Time? A wise Indian Chief said “only the Government would think you can cut a foot off one end of a blanket and sew it to the other end and make a longer blanket”. That pretty well sums up my feelings (at the least the ones I can publish) about Daylight Savings Time. There are good things, some bad things, and some real ugly things though about my recent experiences with this one hour change. The good thing is it is lighter early in the morning. 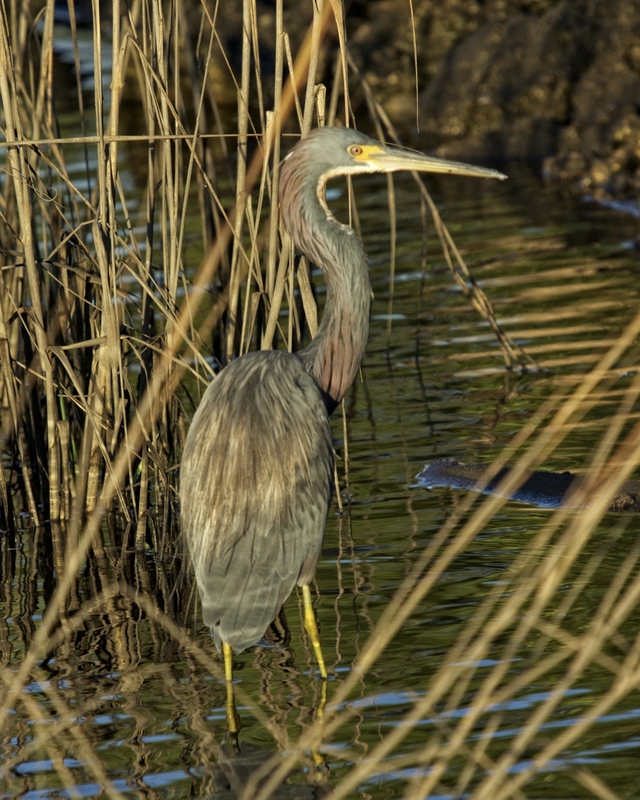 I love to take photos of birds on the Broward bathed in the golden glow of the early sunlight. I was fortunate to catch a few Pied-billed Grebes and some Double Crested Cormorants recently swimming by. So far they haven’t been too spooked by my presence but I have decided to use a blind in case the Hooded Mergansers show up soon. These beautiful ducks are very skittish and camera shy. Hope to see them soon. The Bad thing is I am going to bed too early because it is dark and then waking up too early (and the Editor is having a rough time adjusting too). It is also bad if you are a fish enjoying a morning swim when an Osprey decides to have breakfast...and it’s you!. And then there is the plain ugly. When I don’t sleep right it is not a pretty sight. But even in good light, it is hard not to look ugly when you are a Wood Stork. Hope you didn't miss the Harvest Moon last month..if so here tis..then came the change from Daylight Savings Time (Yech). The Good...Pied-billed Grebe in the early morning light before the change from Daylight Savings Time..note the bright eyed reflection.. The Bad...Same Grebe after the change from Daylight Savings Time...Note the reflection is still half asleep! Double Crested Cormorant surfaces in the golden morning light..
Good day for an early morning swim..unless you are a fish and become breakfast for the Osprey..! Bad! Bbbb Bad to the bone!...fish bone that is! No matter how great the light..Wood Storks are just plain ugly no matter what time of day..
No matter what angle you capture them..they fly pretty but ugly.. It's a tough job but someone has to deliver the ugly babies too..(someone had to bring Hillory into the world you know). Take the Good, the Bad, and the Ugly all in stride and every day will begin like this! One of the first birds I attempted to photograph was a Belted Kingfisher (female) by the name of Spunky. This bird species in general, and this one in particular, has been a photographic nemesis for me since day one of my photography journey. Like the illusive 007 spy James Bond, Spunky has remained difficult to capture. As soon as I walk outside the back door, this bird and its mate take off and remain out of close camera range until I leave the area. High on my bird bucket photo list now, the Belted Kingfisher has indeed been a challenge to approach. One of my friends and fellow photographers (Ron Bielefeld), has had much better success. Ron discovered a small pond near his home in southern Florida that a particular Belted Kingfisher (male) frequents and then spent six years getting the perfect setup for photographing this illusive bird from a blind and perch arrangement. Actually Ron discovered what may be a new sub species called the "Bonded" Kingfisher. While on a recent workshop with Ron and another client, we slog through the swampy marsh and arrive before dawn, set up some blinds and wait. The early morning rays of sun no sooner arrive when 007, a "Bonded" Kingfisher shows up too. We sit for hours watching this bird perch and scan the pond for minnows. The villains from SPECTRE attack. 007 subdues them. To celebrate, like Bond, this bird likes his minnow martini “Shaken, not stirred”. In 2013 I captured this photo of Spunky, a female Belted Kingfisher near the dock. I have not had a decent photo of this species since. They are very illusive and hard to capture. 007, a male "Bonded" Kingfisher arrives at the crack of dawn on its favorite pearch. 007 sits proudly and aloof, ready for action..
What was that? The soft raindrops almost mask the noise. Trouble is coming..007 remains alert.. Some dastardly villains from SPECTRE, in the guise of Juvenile Little Blue Herons attack and chase 007 from his perch..
007 pushes a secret ejection branch button and regains the high ground..
Time to celebrate. 007 spots his favorite minnow martini...and dives..
That is correct Miss Moneypenny...007 prefers his minnow martini "Shaken...not stirred"..now where were we?